You are in the second year or third year of graduate course, then you would have probably experience the buzz word ‘internship’. It would create a small fear in your mind, where to go and how to proceed with the whole process. Internship is an opportunity offered by companies or organisation for prospective employees who are otherwise considered as interns to work for a limited period with them. The internships are full time or part times. You might be figuring out why you need to take an internship while studying when you already have enough on your plate. There are many reasons for university undergraduates in doing an internship before starting the real work at a company. The most important and the sought after could be some of them highlighted. Internships are opportunities for one to make the right choice when he/she does not know what to do after college. As the market trends vary with time, many students get stranded in the forest of job search without knowing where to go or what to do. Make sure that you select the field you want to work in and then the specific industry offering that. Once you get into the company or start up, you will be having exposure to various departments. If the start-up is small organization then you would be having more exposure to all the departments and access to all the employees. It’s also another way of knowing about the roles played and how much of responsibilities they would have. By experiencing the roles you would be in position to make the choice of career path you would like to take. Like said earlier, if you are part of a small start-up then probably you would be exposed to all the aspects of the business. It could be relating with the designing team or having a chat with the head of the customer service over lunch. Being a part of a small company will surely help you know all the parts of the company as everyone stays connected or are in the loop. Also you would get to know the overall business matters as you would be allowed to participate in the meetings that happens every day. Moreover you could become part of the project that is upcoming or part of a brainstorming session to crack a solution to a burning issue. This reality will bring in experience to your resume. Being a part of start-up team will facilitate you to meet each and every person of the various department. Definitely you would befriend them and surely will become your friends that you add to your contact list. They do not become just friends but good business friends who last for a long time whether you come back to work here or not. Most of the time interns are always concerned about getting to know about how to work alongside a team. You would develop the culture of working with different set of people and learn how to adapt yourself to the culture of the team work. Having to work along with team who are handling customers or vendors will make you to experience the way to handle with them and how to take care of work load that may arise with time. It one way teaches you to handle the responsibility that is part of the job profile. Beginning of the work project is sure to bring in the fear of handling responsibilities. But when going into internship with a start-up you would get the feel of the real work experience and try to manoeuvre yourself throughout the process. Each step has certain responsibilities that you know only when you have your hands on it. So try to make use of internships to gain confidence and also be empowered while doing your work. Start-ups don’t have enough resources to protect interns joining their team not have time to oversee or check out all the work that is executed. Hence, whether it is mistake or not you would be made to judge the right from the wrong. The important fact is that they would rely on you for the output and thereby they would appreciate for all the efforts you have put in. The team will surely recognize for what you have done while you learn new methods of doing things. For start-ups they do need fresh ideas and thoughts to run their business. Here is a chance for doing something which was not done before or you probably do not have the training to do it. Don’t hesitate when you have been assigned to do a work you have not done. Get more information from net or social media to cater to the needs of the work. Try out those and if your successful then good. If not let it be a learning experience! It is one way of testing your resourcefulness and creativity. You get inspired if it works out well. Being an undergraduate you would not have much exposure to latest technology that is in the market. Getting into interns with start-ups is surely one way to feel the new technology. Start-ups do not worry about using the latest web tools for their work as they are more tech savvy nowadays. Hence, this will definitely help you to utilize the latest tools for the work where you learn more about it. In today’s digital world, this matters a lot and you are sure to see it for yourself. 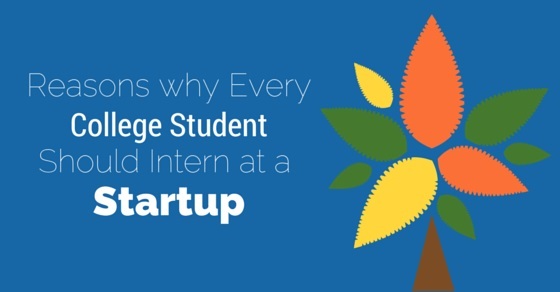 Doing internship at any company is different from doing it at a start-up. The difference being that there would be certain roles or functions already defined and you would just need to learn only the assigned ones. But in start-ups, you are also part of the developing business where you would be sharing your views and knowledge. It attracts best people of same thoughts as they are of same age groups who enjoy doing their work by sharing their knowledge and experiences. In other words, the aura of positivity flows and everyday will be a learning phase. This would help the start-up flourish and bring the idea to work. Thoughts will be positively focused. Having to work inside start up requires to do work within short span of time. Time being a significant factor, you as intern would be dealing directly with clients along with the other members. This will make you to take ownership for the project or work assigned. Besides there is an opportunity for you to show cast your talents while executing the work. Meeting deadlines is the first priority that will help you to master the way to perform the work. It helps to understand the meaning of ‘deadlines’ in the real world that is normally not known to students studying at colleges. It’s the aspect of time management skill that you learn on the way. Start-ups usually do not have enough resources or enough cash or time to invest. The group will be small and the strength lies in driving the progress with less. Initially this is trend of a start-up and if you are part of the team then you would see and experience the pain of accomplishing the needed within certain time frame. Bigger companies would have all the resources to get it done. But working for these start-ups will help you to learn the various tasks that require skill and accuracy. As said, it’s a learning phase to know that you may be required to make the product and take the measurements and same time make entries for data in the system. So not only you would learn the method of multi-tasking but also learn the various steps that goes into getting the work accomplished. So what are you waiting for? Browse the internet or get reference from your parents or seniors to get into a start-up that will provide internships. Its gateway to gain real life experience and get those resume filled up. By getting into start-ups you are sure to get into good companies as you would eventually possess the intelligence, motivation and talent required. Besides, it is exciting and fun as the individuals are almost of the same age groups. Such age groups are filled with enthusiasm and brilliant ideas or thoughts that is mostly shared to bring out new thoughts in the process.